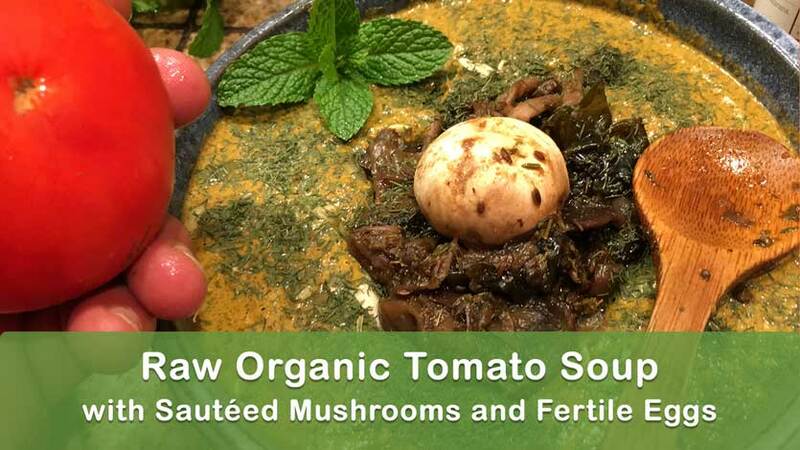 Raw Organic Tomato Soup with Sautéed Mushrooms and Fertile Eggs. 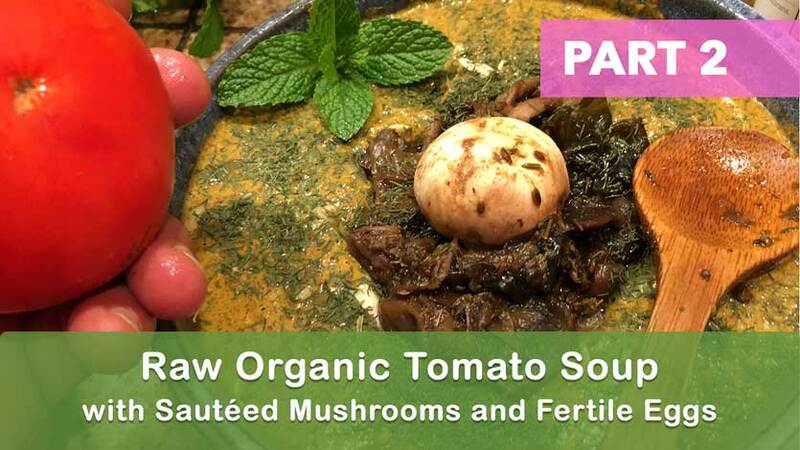 This is my 3 course “Raw and Cooked” dinner, and we are going to make one of my favorite Transitional Recipes that everyone will like and will get super nutrition at the same time. We are going to use my home grown veggies out of my organic garden and some organic superfoods, and of course my Earther Kitchen. The recipe workshop is a from my heart, so we are going to try and connect some of the dots in this mini lecture to give you some ideas of a raw living food/cooked dinner snack. This is a Blood Free and Ketogenic Diet Recipe for transitioning from eating any flesh. In Part 1 we will go over the basic recipe, talk about cleaning your vegetables and upgrading your Earth Shift Kitchen. 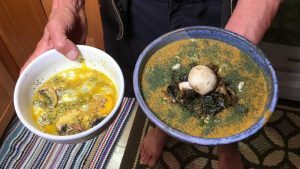 In Part 2 we will show you to make the mineralized, nutrient dense super soup, using the added simple smart protocols to transform any soup, or sauce recipe, into a super nutrient, mineral rich meal. These types of multi layered meals are a fantastic way to transition away from meat, fish and flesh of any kind. 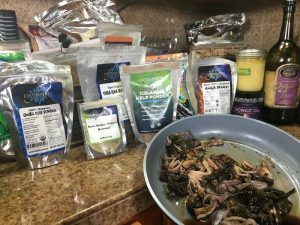 I have found that it is essential and necessary, for most people, to have a variety of new plant proteins from organic seeds, superfoods of all types, organic local raw goat milk, sprouted nuts, fertile eggs, organic live veggies, spirulina/chlorella/algae, etc. to name a few. I have always recommended patients eat 2 eggs (soft boiled) at least 2-3 times a week when transitioning out of a high protein, meat saturated diet. Otherwise, you will most likely feel weak or have lost your energy from the transition from flesh to no flesh, which can take up to 6 months or more, before the body accepts the new types of proteins and foods. Most people won’t follow through with the 180 days of detoxing/rejuvenation terrain modification protocols if they feel weak and tired all of the time, so give these recipes a try. Removing toxic meat and flesh from your diet, for 180 days, will greatly decrease toxicity, intestinal debris and parasite loads. If you feel you need to go back to eating meat then only eat organic and a limited amount. Never add any added sugars from the store bought ingredients in this recipe at all. Keeping the sugar down is one of the main tenants of the Earther Academy terrain modification protocols, practices and principles. Always wash all of the organic veggies, herbs etc. before blending and adding other ingredients, or eating. Even if they are organic – please wash them anyway. I use Organic Coconut Oil Soap to wash my veggies, or a few tablespoons of white vinegar in water. We need to make sure we have clean ingredients, because we are not cooking this meal to kill it or sanitize the foods from pathogenic bacteria, urine or feces from rodents or insects. I like to use a large VitaMix or a large Cuisinart Mixer, and you add the ingredients directly into the mixer. The Super Nutrient Rich Mineralized Recipe is available for Earther Members below the Video! 2 lbs of Organic Tomatoes. 2 bunches of Mustard or Arugula Lettuce. I like to add a a lot of different Veggies, Kale, Mustard Lettuce and Radishes to my soup. If you just want the tomato taste then only use the tomatoes. 8 tsp of Raw Apple Cider Vinegar or our Mineralized Vinegar Recipe. 1 big or 2 medium sized Organic Fresh Lemon or Lime Juice. I like to use 1/4 – 1/2 cup of lime or lemon juices equally with the amount of the oils I add to the recipe. Only use Organic Oils, and use 1, or a little of all of them together. 1/4 cup of Organic Avocado Oil and/or Olive Oil combo. 1/4 cup of Organic Raw Coconut Oil (this adds a coconut flavor to the recipe), or just add a 1 Whole Ripe Avocado instead of the Oils. Use what ever spices or herbs that you like. Make sure all your spices and herbs are organic, or better yet fresh from your garden! Optional: add 2 tbsp of Raw Ghee Butter or Organic Coconut Oil on the top of your soup/sauce, when you are ready to eat this masterpiece. I also like to add a hand full of soaked Sunflower Seeds or Pumpkin Seeds on top, after you are finished blending and ready to savor your creation. You can also add for super flavors sautéed organic Mushrooms, Purple Onions, Stir Fry. We added the Fertile Duck Eggs to the transitional meal, which full of lecithin and growth hormone. Always add clean water (I use Pure Distilled Water only) as needed, to blend your creations to the desired viscosity or thickness. Remember, if you are removing flesh and blood (the main form of food for the blood sucking parasites that live in the body of almost everyone) from your diet, then (I found out) it is a good idea to supplement your diet with organic fertile eggs a few times a week for the sulfur, lecithin and protein, in order to transition to a much less dense and toxic non-flesh protein (Fertile Duck Eggs are much more nutrient rich than Organic Chicken Eggs). Again, if we want to support rebuilding our nervous systems, we need oils and lots of water. Fertile Eggs are loaded full of lecithin and the full amino acid profile needed for supporting the nervous tissue to rebuild. I have found the fertile eggs really help in the regenerative process of the body and the mind. The eggs must be fertile. 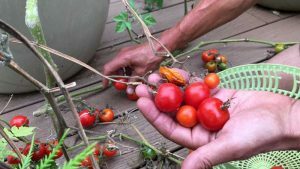 Recommended Courses and Categories: How To Make Super Mineralized Sole Salt, Earther Kitchen, The Miracle of Fertile Eggs, Ferments, Gardening.